Ce manuscript – l’un des plus grands au monde (92cm x 50cm x 22cm, 75kg, velins ayant necessite 160 peaux d’anes…) – fut cree au debut du XIIIeme siecle dans le monastere benedictin de Podlažice en Boheme. Il se retrouva ensuite dans la collection de l’Empereur Rodolphe II en 1594, mais fut vole en 1648 par l’armee suedoise a la fin de la Guerre de Trente Ans et ramene en Suede comme butin de guerre. Le Codex est garde depuis 1649 dans la Bibliotheque Royale a Stockholm. The Codex includes the entire Latin Bible, Isidore of Seville’s Etymologiae, Josephus’ Antiquities of the Jews, Cosmas of Prague’s Chronicle of Bohemia, various tractates (from history, etymology and physiology), a calendar with necrologium, a list of brothers in Podlažice monastery, magic formulae and other local records. The entire document is written in Latin. The manuscript includes illuminations in red, blue, yellow, green and gold. Capital letters are elaborately illuminated, frequently across the entire page. The codex has a unified look as the nature of the writing is unchanged throughout, showing no signs of age, disease or mood on the part of the scribe. This may have led to the belief that the whole book was written in a very short time (see Legend). Page 290 (otherwise empty) includes a unique picture of the devil, about 50cm tall. Several pages before this are written on a blackening vellum and have a very gloomy character, somewhat different from the rest of the codex. According to legend the scribe was a monk who breached his monastic code and was sentenced to be walled up alive. In order to forbear this harsh penalty he promised to create in one single night a book to glorify the monastery forever, including all human knowledge. Near midnight he became sure that he could not complete this task alone, so he sold his soul to the devil for help. The devil completed the manuscript and the monk added the devil’s picture out of gratitude for his aid. 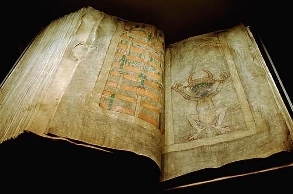 Borrowing the Devil’s Bible (Radio Prague): la demande officielle de pret temporaire du Codex. ~ by larchiviste on 10 January 2007.
je veux aprendre plus sure vset bible….je sui curieue.